An asthma action plan is a proactive way to keep your asthma under control. It’s written with your health care provider (HCP) and is personalized (just for you) An asthma plan has 3 zones – green, yellow, and red. The green zone lists what medications you should take every day when you are feeling well. The idea behind having a “plan” is having important information such as: steps you need to take to stay symptom-free, a list of your medicines – the doses and how often you take them, your health care provider’s phone number, and a list of your asthma triggers, so you can have all these facts in one central location. You should have a copy of your Asthma Action Plan at home and with the nurse at school. You can also make a copy of your action plan and keep it with you. An asthma action plan also includes simple and clear instructions about how to identify early symptoms of an “asthma flare-up”, how to treat them, and when to go to the emergency room. You should feel comfortable talking with your HCP about your action plan and update it as things change. 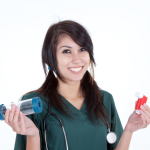 Your fast acting inhaler (Albuterol) does not start to work within 20 minutes of when you take it.